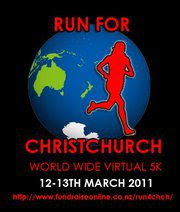 Fit to Blog: RUN for Christchurch! One of the few (at this stage very few) positive things to come out of this disaster is the tremendous cascade of moral support and practical action that has poured forth from people that have an internet presence. This post is about some superbloggers that have come forth en-masse to use their powers for the good of Christchurch. 1. This post from Shauna (Dietgirl - possibly the most famous weightloss blog on the interwebs). 2. This post from Kek, who happens to be a force of nature herself (but in a good way). Both of them are blogging about these examples of fabulosity. A group of runners have organised themselves for a bit of a run, with the goal of raising some much needed cash for Christchurch. They have already raised more than $3500, which makes me want to hug them all until they squeak. One of them, the groovy Lucinda Mathieson, was on the teev this morning - Good Morning, TV1, looking gorgeous (or so I've heard, shamefully I was catching some zzzz's at that early hour) and exhorting the nation to sign up. Lucinda is a facebook buddy of mine and I'm feeling very proud of her right now. No matter where you are, you can do this too. Whether running or just supporting, head over to the fundraising page here and commit. Edit: just in case you stumbled upon an earlier form of this post, which began by spewing venom at the many fitness bloggers that have studiously ignored my emails and pleas for them to link to a fundraising page, I apologise. The focus at this time should be on those that do care, not the many that are all nice words but no action when it is called for. Could it really be that I have developed some... discretion....? Thanks so much Sara! I've been lurking on your blog for a little while, so it was wonderful to see this post. It's people like you who inspired us to do this. The response has been far greater than we ever imagined, and really inspiring. Four of us (minus Mike, who's stuck in Tauranga) will be thinking of you when we run round the Bays here in Welly next Sunday! It really doesn't take much effort to help out with something like this. Most of us have limited resources when it comes to cash donations, but spreading the word costs nothing and isn't hard. I'm about to go check on some of my blogger mates and if they haven't posted about the run or the appeal or something, I'll be hounding them. Oh, and my point is, if every blogger gave $5, that would be a LOT of bucks. 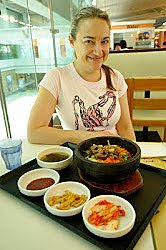 Clara, I just blogged about this today.